In 2010, 5.9 million children were reported as abused or neglected in the United States. If you were a policy maker and you knew of a program that could cut this figure in half, what would you do? What if you could reduce the number of babies or toddlers hospitalized for accidents or poisonings by more than half? Or provide a 5 to 7 point I.Q. boost to children born to the most vulnerable mothers? Well, there is a way. 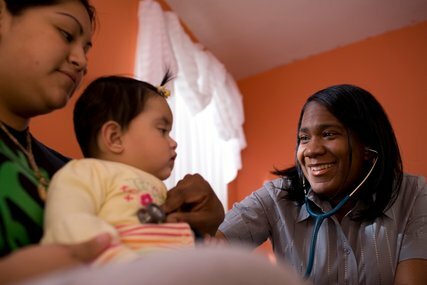 These and other striking results have been documented in studies of a program called the Nurse-Family Partnership, or NFP, which arranges for registered nurses to make regular home visits to first-time low-income or vulnerable mothers, starting early in their pregnancies and continuing until their child is 2. What that means, notes Baron, is that if policy makers replicate the program faithfully they can be confident that it will change people’s lives in meaningful ways — improving child and maternal health, promoting positive parenting, children’s school readiness and families’ economic self-sufficiency, and reducing juvenile delinquency and crime. NFP is not a new idea — it’s almost 40 years old — but after decades of study the program, which has assisted 151,000 families, has the potential for broader impact, thanks to the Affordable Care Act’s Maternal, Infant, and Early Childhood Home Visiting Program, which provides $1.5 billion for states to expand such programs. Done well, it could be among the best money the government spends. Investments in early childhood development produce big payoffs for society. (A 2005 RAND study estimated that NFP provided $5.70 in benefits to society for every dollar spent.) But there’s an important concern: home visiting programs are not all effective. When carefully studied, only a few have been shown to reduce the physical abuse and neglect of children. Among the programs that meet the government’s standard for funding, there are large variations in evidence of impact (pdf). Policy makers and proponents of home visiting would do well to pay attention to the specific elements in the Nurse-Family Partnership’s model that account for its success. NFP was founded by David Olds, who directs the Prevention Research Center for Family and Child Health at the University of Colorado Health Sciences Center. Early in his career, Olds worked in a day care center in Baltimore because he believed that quality preschool attention would help disadvantaged children succeed in life. What he began to see was that, for some kids, it was already too late to make big gains. If children had been abused or neglected or exposed to domestic violence, or if their mothers had abused drugs, alcohol or tobacco while pregnant, their brains could have been damaged in ways that limited the children’s abilities to control impulses, sustain attention or develop language. Olds developed NFP in the early 1970s. He conducted his first large study in 1977, in Elmira, N.Y., a semi-rural, mostly white, community with one of the highest poverty rates in the state. The program produced strong results. Follow-up studies would reveal that, by age 19, the youths whose mothers received visits from nurses two decades earlier, were 58 percent less likely to have been convicted of a crime. In the 1980s and 1990s, Olds spread the work to Memphis and Denver and subjected the program to more randomized study with populations of urban blacks and Hispanics. The results continued to be impressive. In 1996, NFP began wider replication; the model is now being implemented by health and social service providers in 40 states. As Olds published his results, the idea gained momentum, but the imitations did not remain faithful to NFP’s approach. “People adopted all kinds of home visiting models and used our evidence to make claims,” he recalled. In the early 1990s, for example, the federal government, inspired in part by NFP, began a $240 million program to train paraprofessionals, rather than nurses, to make home visits to low-income families with young children. NFP also experimented in Denver, using paraprofessionals (trained from the communities they served) in place of nurses for a subset of families. In both cases, paraprofessionals didn’t get the same results. When it came to improving children’s health and development, maternal health, and mothers’ life success, the nurses were far more effective. In the federal program, paraprofessionals produced no effects on children’s health or development or their parents’ economic self-sufficiency. What’s special about nurses? For one thing, trust. In public opinion polls, nurses are consistently rated as the most honest and ethical professionals by a large margin. But there were other reasons nurses were effective. Pregnant women are concerned about their bodies and their babies. Is the baby developing well? What can I do for my back pain? What should I be eating? What birthing options are available? Those are questions mothers wanted to ask nurses, which was why they were motivated to keep up the visits, especially mothers who were pregnant for the first time. A big part of NFP’s work is helping them answer this question. Over the next two years, they embarked on a journey together. “I had a zillion questions,” Rita recalled. “I was really nervous at first. I had lived most of my adult life as a drug addict. I didn’t know how to take care of myself.” On visits, they discussed everything: prenatal care, nutrition, exercise, delivery options. After Rita’s daughter, Danika, was born, they focused on things like how to recognize feeding and disengagement cues, remembering to sleep when the baby sleeps, how to manage child care so Rita could go back to school. For Rita, what made the biggest impression was hearing about how a baby’s brain develops — how vital it was to talk and read a lot to Danika, and to use “love and logic” so she develops empathy. Once Valerie explained that when babies are touching their hands, they’re discovering that they have two. “To me that was really amazing,” Rita said. Beyond the match between nurses and first-time moms, there are multiple factors that make NFP work. (NFP has identified 18 key elements for faithful replication.) The dosage has to be right: Nurses may make 50 or 60 visits over two and a half years. The culture is vital: It must be non-judgmental and respectful, focusing on helping mothers define their own goals and take steps towards them. The curriculum should be rigorous, covering dozens of topics — from prenatal care to home safety to emotional preparation to parenting to the mother’s continuing education. Nurses need good training, close supervision and support, and opportunities to reflect with others about difficult cases. And, above all, data tracking makes it possible to understand on a timely basis when things are working and when they are not. With the government making such a large investment in home visiting, it’s crucial for programs to get the details right. Otherwise, society will end up with a mixed bag of results, and advocates will have a hard time making the case for continued support. That would be a terrible loss. “When a baby realizes that its needs will be responded to and it can positively influence its own world,” says Olds, “that creates on the baby’s part a sense of efficacy — a sense that I matter.” It’s hard to imagine higher stakes.